The Downside isn’t quite the dreary purgatory you would expect. Spending your exile taking part in the rites with your ragtag party of wanderers in Supergiant’s latest title Pyre is probably the most enjoyable punishment out there. If I was cast into The Downside, condemned to perform the rites of Pyre, I think I’d have a pretty good time. It’s all adventures in a wagon with your mates and throwing a ball about. Supergiant Game’s latest title is yet another unique genre hopping game that explores a twisted new world of lore, ritual, and redemption. You’re a ‘Reader’, an oddity and an outlaw in the world of the commonwealth, and so you find yourself exiled in the Downside. Able to read the Book of Rites handed down by the Scribes, you help a ragtag group of masked wanderers to participate in a series of trails known as the rites, to prove themselves worthy and ultimately gain their freedom. What’s the downside of being exiled to the Downside again? 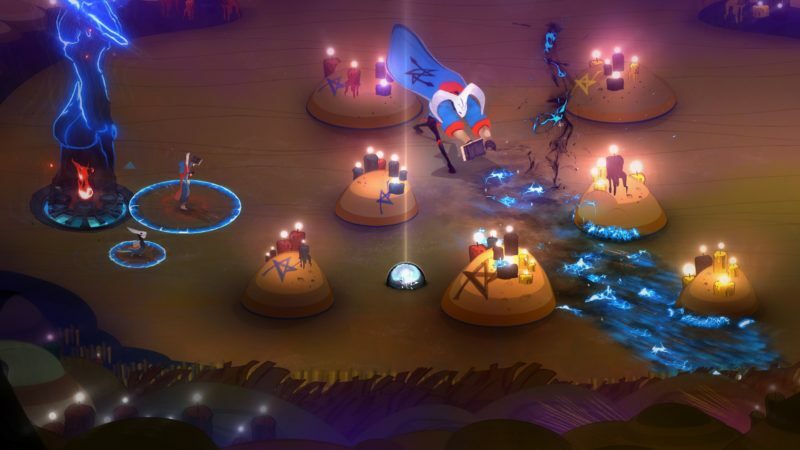 Pyre is best described as a party based RPG. At its core the game revolves around the party of characters surrounding you, and the world they find themselves in. And a beautiful world it is too. Pyre is one of those games that made me smile to myself at the smallest things. Animated splashes of colour behind your party members give life to their emotions. Sharp red spikes for anger, or a gloomy blue swirl for disappointment. Little drops of creativity are found at every turn and they blend together to create a seamless world. Supergiant Games have proven time and time again that they pay attention to detail, and Pyre is no different. It’s a painted storybook where you choose your own adventure. The characters mean something to you, and it’s those bonds and the beautiful world that drive the game. You’ll come to love your little team of wanderers. And yes, you can get rid of that moustache. Pyre is a game you can admire without even taking part in the rites, the game’s core combat mechanic. The Rites are Pyre’s version of an encounter for your party. It’s a 3v3 battle with two end goals and a ball. It sounds simple enough, but the depth comes with the different classes of your characters and how you choose to use them. It’s a fun system, and I definitely enjoyed finding the perfect run to weave between enemies and score. The rites aren’t the essence of the game, they’re more like Pyre’s replacement for turn based combat. In that regard they’re certainly a step up, but I can see them being a distraction for those that don’t enjoy them. Each race represented in Pyre plays completely differently in the rites. If you’re looking for the same tone as Bastion and Transistor you may come away slightly disappointed. Pyre is less narrative than Supergiant’s previous games, and a consistent flowing story is sacrificed in part for freedom of choice and branching paths. 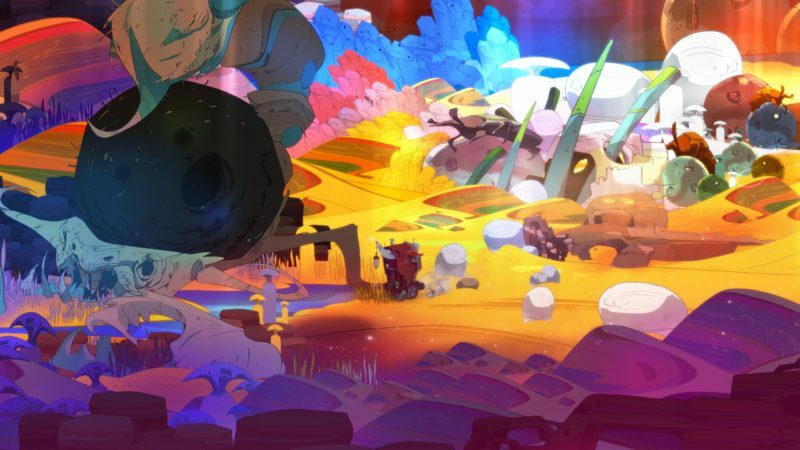 The story of Pyre is in the characters and the world around them, it’s not told to you as forward facing as Transistor and Bastion. It’s a story you discover and build for yourself. Your choice of which characters to use in the rites, who to put forward for liberation, and which enemy teams to face, all write chapters of your story in front of you. I loved this element of the game. The world and story of Pyre feel alive and adaptive based on your choices as a player. Ultimately Pyre is another resounding success for Supergiant Games. Their palate is a little different this time, but still they’ve painted a deep new world, brimming with character. 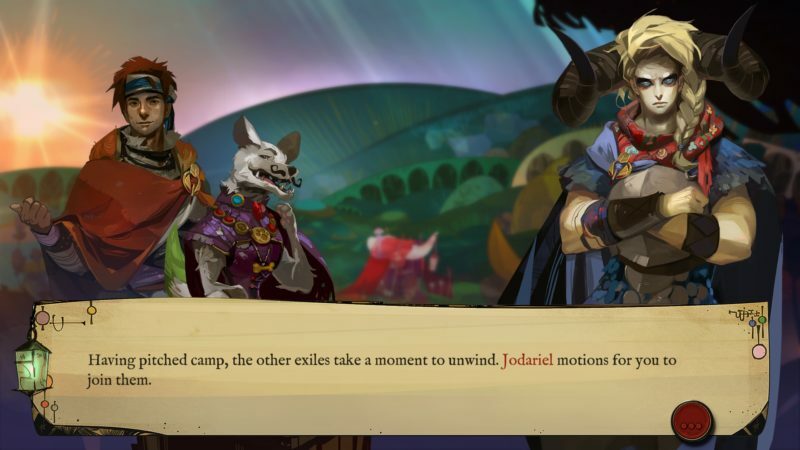 They’ve taken their hands off of the reigns for Pyre and allowed you as the player to tell a large part of the story. The rites are an interesting replacement for turn based combat, but it is a system you’ll either love or hate. Plus, with a versus mode, optional side lore, and a training area there is plenty to explore for those willing to dig a little deeper. Pyre is a beautiful and unique party based RPG. Supergiant Games have shown time and time again that they’re happy to do their own thing in the world of gaming, and as a result Pyre is clearly the game that they wanted to make, no compromises. It’s not the flowing narrative of Bastion or Transistor, instead it’s the choices you make that define your experience. Josh is from a sleepy town in England, where he would spend free school periods with friends eating pizza and hosting Smash Bros tournaments. If Timesplitters 4 ever comes out, expect to find Josh comatose from shock and happiness.